Last time we discovered that gratitude is connected to faith and deep joy that leads us to drink the cup of thanksgiving. It also can become a daily discipline, especially when you are taking on this journey in small steps. Yet sometimes we are called to times of deeper fasts. We are often told that during Lent, we are to give something up and take something on. Often folks give up coffee, tea, chocolate and other sweets. One year I gave up television, and another credit cards. Others give up Facebook and other social media. This year I wasn’t sure what to give up, until I began working on February’s article for Ways to Grow in God. I had recently finished the third article of a series on thankfulness and gratitude. Originally I had planned to write only one post on thankfulness. However, there was so much more to the topic than I realized! It has turned into a mini-series on one of the many ways to grow in our Christian faith. I still have another article to write on gratitude as a lifestyle in the context of difficult ministry. I’ve been learning more about the “joy of the Lord,” which the Old Testament prophet Nehemiah calls our strength (Neh. 8:10). That joy actually is more of a deep contentment and trust in God than actual laughter, but it can include this as well. It is an unshakeable knowing that God is faithful; you believe you will be okay despite difficult circumstances. It is a joy that comes even in suffering, and is far deeper than the optimist’s ‘half-full’ glass. It is more like the cup of thankfulness that runs over (Psalm 23:5). This cup of joy sustains you even in the deepest, darkest suffering, persecution and difficult times. The cup sustains us because of the One who gives us the cup. When you drink this cup of joy, your eyes are completely focused on Him. So, since I want to journey with more of that joy, I took a stand on negativity and complaining in my own life. I declared along with my Kingdom Culture pastor, Shawn Gabie, “If I have a problem, there is a solution.” And if I get impatient, I will leave my struggle in God’s hands. I learned the art of “re-framing” in one of my counselling classes at Tyndale Seminary (Toronto, Canada). The idea is to look at a ‘bad’ situation through a new perspective. It is to take how you see the picture of your difficult situation and see it through a new ‘frame’ of mind. Often when you perceive a difficult situation negatively, it seems even more menacing and it “looks” like you’re facing an impossible obstacle. What do I mean by this? Think of how you may feel if you’re having a ‘crummy’ day and you believe the ‘crummi-ness’ will last all week. You may feel as if a rain cloud is continually over your head, despite the weather. You might feel that negativity encompassing all of your life, when in reality, that difficulty is a very small part of your life! So along comes a friend or counsellor who has the art of re-framing. They see possibilities in your difficulty. They see a positive challenge that offers growth and reward on the other side. It helps to have a friend who can encourage you in this way. However, you can also learn to do this yourself by choosing to look at every aspect of your life in a positive way. Yes, this is a challenge, but the Holy Spirit can help us – he is the ultimate ‘re-frame’ counsellor in our lives. God never puts us down; he never condemns us. He convicts us of sin, yes, but he cleanses us when we come to him and say we are sorry. He also shows us possibilities. Have you considered taking up a negativity fast? You may have missed Lent, but this is a journey you can take ANY time of the year. 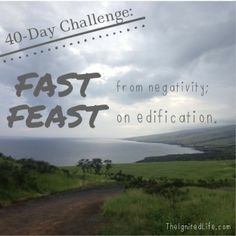 Leaders Steve and Wendy Backland of Igniting Hope Ministries encourage this kind of fast for forty days (which is the length of Lent without counting the Sundays). Christian neuro-scientist Caroline Leaf also works on the same principle in a 21 day period (only concentrating on eradicating one negative thought pattern rather than many). A negativity fast also includes feasting on and thinking positive thoughts, like Philippians 4:8 encourages us to do: Finally, brothers and sisters, whatever is true, whatever is noble, whatever is right, whatever is pure, whatever is lovely, whatever is admirable—if anything is excellent or praiseworthy—think about such things (Phil. 4:8 NIV). Consider yourself a pilgrim in the land of the positive. I wish you well on your journey as we walk along together with thanks and gratitude. Next time, we will continue on with the Cup of Gratitude as we explore gratitude in the context of ministry. Laurie-Ann volunteers for Kingdom Culture Ministries in admin and media. She also has shares two radio shows at CKCU 93.1 FM. The picture below is when Laurie-Ann ministered and taught in Lahore, Pakistan in December 2007/January 2008. 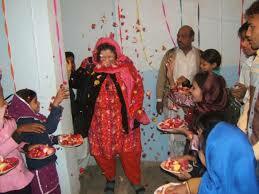 She was greeted and showered with love and rose petals by local Christians.